You can make reservations here for INSTANT Confirmation. 1) Payment can be made via credit card at our Online Booking Engine. Account Name : Paya Beach Resort Sdn. Bhd. Kindly fax or email a copy of your bank in slip to us. To make a transfer via DuitNow, please choose "Business Registration Number” at ID Type and key-in “416417A” to make payment. Upon payment completion, please take note that you will need to email us a copy of your DuitNow transaction along with your Invoice number. Our official check-in time is 2.00pm and check-out time is 11am. If you are arriving earlier, please inform us in advance. We will try to provide you with a more convenient check-in time if your allotted room is available. Do I need to place a deposit upon arrival at your resort? A refundable deposit in any currency equivalent to RM200 upon check in is required. Should there be a change in your travel plans, kindly inform us in advance. Amendments made 4 weeks before the scheduled departure will be charged at RM100 per person.Cancellations or Amendments made less than 4 weeks before the departure date will have no refund. There are no refunds for No-Shows. Do u have Baby Cots? Baby cots are available free of charge upon advance request. Is a visa required to travel to your resort? What telephone number should I give my family members in case of emergency? Our reception desk contact number is +609 4197100. Do you provide Wi-Fi service? Complimentary Wi-Fi services are available at Restaurant and Beach Club. What about cell phone coverage? The service providers are Maxis and Celcom. We do not provide complimentary drinking water at our Restaurants and Beach Club. However, you are able to use the water boilers located in the rooms. Coffee & Tea making facilities are also provided in every room. Usually monsoon season starts from the middle of November until the middle of February. As it is normally a good weather even during the monsoon season, our resort remains open throughout the year and offer monsoon promotions. Ferry operator, Blue Water Ferry Company, operates the ferry from Mersing-Tioman once a day during the monsoon period. The schedule may vary depending on Tide Levels, Sea Conditions and Weather. Kindly take note that activities are subjected to weather conditions as well. Are there any Wheelchairs provided? Wheelchairs are available only for first aid purposes in case of an accident. We have two Standard Chalets that are wheelchair friendly and our restaurant and reception area is wheelchair friendly. Most areas within the resort are flat by nature. It will not be difficult to move around. The snorkeling or dive boats and the jetty are not equipped to cater to special needs. Getting on and off the boats at the jetty area will require specialized assistance, which we are not able to provide. We will however help by cooperating with the trained assistant who accompanies the guest with special needs. Are diapers available for purchase at the resort? Yes, Diapers are sold at our Duty Free Shops. Are strollers available at the resort? Strollers are not available in the resort. Kindly bring your own strollers. Advance request is necessary at around RM50 per day. Legal disclaimers must be signed. Yes, you are encouraged to bring one. The sockets there are “British-style 3 pin square plugs” (Type G). It is 240V and 50Hertz. What is the difference between Paya Beach Resort and TiomanPaya? Please note that there are 2 " Paya" resorts in Tioman. We are "Paya Beach Resort". Our resort is located is at the beach front area and most of our rooms are sea facing. Also, we have the only swimming pool, spa outlet, karaoke, cyber cafe, western/asian restaurant, beach club and a PADI dive centre. The other "Paya" is located behind the river in the forest area. It is called "TiomanPaya Beach Resort". Please see our web site www.payabeach.com. for detail rates or contact our Singapore sales office a Tel: +65 6733 4333 for more information. May I know, is it necessary for Malaysian to bring along their passport for the Tioman trip? No but all the passport numbers or IC numbers are requirement by the Jabatan Laut (Marine Department) for every passenger taking the ferry to Tioman. Do you provide toothbrush and toothpaste? Kindly note that complimentary toothbrush & toothpaste is available at our Front Office. What are the dining options at Paya Beach Resort? Meals and snacks are served at our main restaurant, open from 7.00am to 10.00pm daily. Meals ordered from our ala-carte menu starts from RM10 upwards per person. Choose from a wide selection of dishes from healthy salads to live lobster and crab, Malaysian curries and Chinese stir-fry recipes. We have daily buffet dinner from RM42+ per adult. For a choice of western dishes, duty free wine, beer and liquor, The Islander's Beach Club serves guests from 11am to 1.00am. Outside the resort, there are several smaller eateries around Paya village you can choose from. (You may want to know that prices are about the same as our restaurant). We have an official “A” rating from the government health department. Who do I contact about special diet requirements or food allergies? Can I make reservations for dining or onsite activities before I travel? We advice you to make reservations in advance. Kindly email us at sales@payabeach.com to make reservations. Is Mini Fridge provided in the rooms? Only Deluxe Chalets and Deluxe Suites are provided with a complimentary mini fridge. Guests from the other room types may choose to rent one for your stay for an additional RM20 per day at the Reception desk. Do you serve Birthday cakes? Are there any Barbeque Pits? Yes, our resort has barbeque pits. If you wish to have a personalized Barbecue, kindly email us at sales@payabeach.com .All food for the personalized barbeque must be supplied by the resort due to religious dietary considerations. Are there any safe keeping facility? You are encouraged to use our individual safe deposit boxes located at the Reception Desk. Is housekeeping available at the resort? Yes, Rooms are serviced daily. Tea/Coffee making facilities, Air conditioners, Hot/Cold showers, Television (Except Standard lodge), Intercom “Room to Room” and “Room to Reception” dialing are all standard amenities. Are Hair Dryers available at the resort? Hair dryers are available at our Reception desk upon request. Is there Mini Fridge provided in the rooms? Only Deluxe Chalets and Deluxe Suites are provided with complimentary min fridges. Guests from the other room types may also choose to rent one for your stay for an additional RM20 per day at the Reception desk. Towels are provided in our rooms. In order to help us conserve the environment, towels will not be changed daily during your stay at the resort. Should you need to more towels or change, please feel free to contact our reception desk. These towels are for use exclusively in the rooms only. If you wish for towels outside of your rooms, Beach towels are available from our Activity Desk. Are there any multi-purpose hall/ meeting rooms? Our resort offers 1 multi-purpose hall that can cater up to 120 pax and 1 meeting room that can cater up to 60 pax. If you require a LCD projector, flip charts, speakers, microphones, paper, pencils, and drinking water while using our multi-purpose hall and meeting rooms, prior reservations must be made. Yes, the charges are based on the type of clothing. Yes, We have 4 channels of satellite TV in the guest rooms and In-house movies are available in the movie rooms. Is there any DVD player inside the room? What are the different types of Chalets that are available? At Paya Beach Resort, we offer 8 different room categories. All our rooms come with a private balcony, air-conditioned & equipped with hot water showers. Our different room categories are Standard Chalet, Standard Beach Front Chalet, Superior Chalet, Superior (Pool View or Beach Front), Deluxe Suite Beach Front, Deluxe Chalet Beach Front and Standard Lodge Chalets. Do you have any special packages for honeymoon and special anniversaries? Are there any all-inclusive packages available for guests departing from Singapore? If you are traveling from Singapore, you may contact our sales office at (65) 6636 4333 or visit www.discoverytours.com.sg for an all-inclusive tour package which includes the transfers to Tioman and back to Singapore. Although we accept 1 night stays at our resort,such one night stays are not available on Saturdays due to high occupancy, All reservations that include a stay on Saturday night will be for a minimum stay of 2 consecutive nights. Can I request sea view chalet? While requests can most certainly be made, the management of the resort reserves the right to allocate any room to the guest as long as it is the room type paid for. Allocations of our rooms are done on daily needs and availability subject to the occupancy of the resort. We appreciate your kind understanding. Is there any bed for children? All our rooms are non-smoking rooms. However for the convenience of our guests, cigarette ashtrays are provided outside every room on the balcony table. What spa services do you provide? Who do I contact for Dive Enquiries? 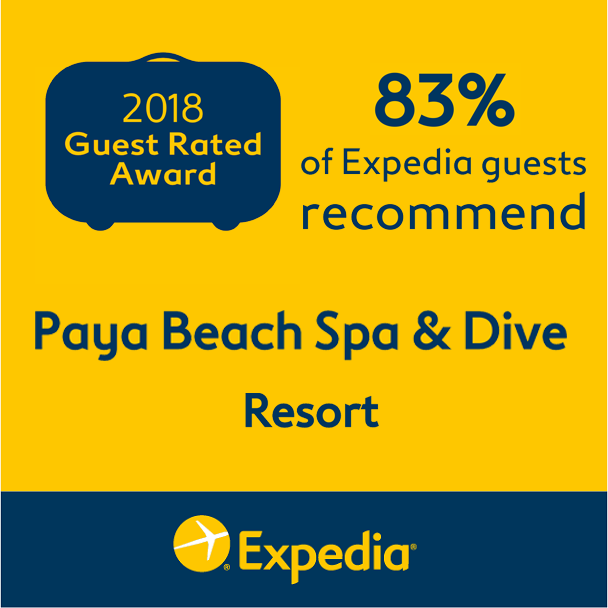 With regards to dive arrangements, kindly contact our 5 Star PADI Dive Centre at diverscove@payabeach.com for your special interest requirement. Kindly note that it is our policy that all divers sent by your company/agents staying at Paya Beach Spa & Dive Resort Tioman must dive with and use the services or rent all dive equipments/boats with/from our dive centre. Should there be any breach in the resort policy; the management reserves the full right to refuse allocation of rooms and other services upon check in day at the resort. What are the children activities at the resort? Children can participate in Snorkeling, Jungle Trekking and Diving. There is a playground located in the Resort as well. The nearest golf course would be at Berjaya Tioman Resort about 20minutes boat ride away. Can I join for a Snorkeling trip but do not snorkel? Customers who have paid for the snorkeling trip but do not wish to snorkel may choose to ride on the snorkeling boat to Marine Park if they do not wish to snorkel. Such guests can walk around the village at the Marine Park, visit the museum there and have a snack or coffee at the hawker stalls there. Please note that guests who ride the snorkeling boat pay the full fees as those who snorkel. Is there any age requirement for Snorkeling? Age 6 onwards. The ability to swim and the wearing a life vest whilst on the snorkeling boat or when snorkeling is a requirement. Am I able to rent a private speedboat for my activities? Yes, kindly email sales@payabeach.com if you wish to do so. Yes, however you would need to bring your own equipment to the resort. What should I bring along for Jungle trekking? The trip usually takes up to 3 1/2 hours conducted either in the morning or afternoon. It covers the monsoon rainforest behind the resort up to a discarded padi field taking in sights of different trees, floral and fauna; and the local birds and insects. Brief stops will be made along the cool streams. A bottle of drinking water, a towel, camera & insect repellent should be brought along. Sneakers or sandals, T-shirt or any comfortable and simple wear will do. How much is the rental of snorkeling equipment? How do I travel from Singapore/ KL to Tioman? Our Singapore’s sales office operates daily coach from Singapore to Mersing/ TanjongGemok. For more information on prices and schedule, kindly visit our website at http://www.discoverytours.com.sg/tioman_transport To get to Mersing from KL, take a Transnasional bus from Puduraya bus station. Buses depart from Puduraya bus station four times per day, at 9.00 am, 12.30 pm, 6.00pm and 11.30 pm. Travel time is approx. 5 hours. From Mersing there are four services, at 10.00 am, 12.30 pm, 6.00 pm and 10.00 pm. Travel time is the same as the KL-Mersing journey. For inquiries on Mersing bus services, you can call 607-7995698. Upon arrival at Mersing, you can purchase fast ferry tickets to Paya Beach Resort at the jetty. The ferry service operates from 7.00 am to 4.00 pm daily. If you wish us to book the ferry tickets in advance for you, kindly advice details of your arrival time at Mersing. Once you have completed your online booking, you will receive the Travel vouchers via email. Kindly email us at sales@payabeach.com if you did not receive your vouchers. Tanjong Gemok Ferry Terminal is in Endau town. If you are driving from JB to Mersing, the distance is about 134 kilometers. From Mersing to Endau,you have to drive another 38 kilometers north. Once you reach Endau town, you will cross a big river, the ferry terminal is on your right. The road name at Mersing jetty is "Jalan Abu Bakar". The parking lot is right next to Mersing jetty. It's known as Mersing jetty car park. How long does it take to sail from Mersing Jetty to Paya Beach Resort? All ferries from Mersing stop at Paya village. Upon arrival, there will be meet and greet staffs to assist. Our Reception desk is only a 3 - 5 minutes’ walk from the jetty. Our Reception contact number is 09-419 7100.